In my head I'm still singing jellicle songs for jellicle cats and humming along to "oh, well I never was there ever a cat so clever...." - and marvelling at the fact that the musical Cats is almost as old as I am. I'd wanted to see it for about 20 years but never went while it was on in the West End - the run finished in 2002. So when I saw that a touring production was coming to Wimbledon just after my birthday I dropped a few hints to my boyfriend and he got us tickets. The show is a feast for the senses- the dancing and costumes are as impressive as the singing, and it's easy to see why the show has stood the test of time. It's a high energy, fun and polished performance and something I'm glad to finally be able to tick off my bucket list. We went on a Thursday night straight from work - I'm always surprised at how long it takes to get to Wimbledon on the district line from the City. We didn't have a great deal of time for dinner beforehand so I had a quick look online for fast/casual dining options, hoping to avoid a chain restaurant I'd been to before as I like to try different restaurants whenever I can. So it was by chance - well, by Googling - that I came across Hot Pink Grill. It could have been invented for my boyfriend and me- there are diner-style burgers and fries and milkshakes (his ideal dinner) but also lighter options including fish (my ideal... who am I kidding. I love burgers, but I need to lose weight). And they have cocktails so it's win win all round. The restaurant was directly opposite the theatre too, which was a big plus. It's diner-style in that you order and pay at the counter, but your food is brought over by a waiter. 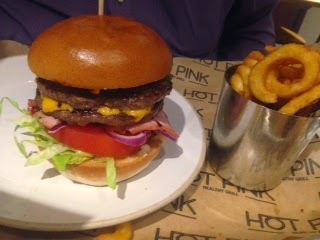 Predictably, my boyfriend ordered the Hot Pink burger (£6.75) - so-called because that's how the patties were cooked, though I ordered his medium as he doesn't like them too rare. Cheese and bacon were added as extras (for another 75p for the cheese and £2 for the bacon) and the burgers also come with a "secret sauce". The fries on offer were either skin-on or curly so he chose curly - why they are a pound more expensive (£4) I'm not sure. He said the burger was tasty and juicy but not as good as Byron, which is one of his favourites. The advantage over Byron however is the breadth of the menu. Hot Pink doesn't have a huge menu but it covers quite a spectrum. It's divided into sections - meat, chicken, fish and non-meat. Rather than the burger take centre stage, it's just one of three things under meat - obviously you can customise it with cheese, bacon, jalapenos, meaning there are technically more menu items - the other two in this secion being a cumberland sausage or steak. The chicjen section offers a chicken burger, marinated chicken skewers or a half chicken, and under non-meat you have a choice of veggie sausage, falafel burger or halloumi and 7-veg stacker (like a multi-layered burger, but without the bun). It's the fish section that is most unusual for somewhere that resembles a burger diner like this. You can have a fish finger roll, which was very tempting, or a salmon steak sprinkled with lime and pepper, or a whole seabass stuffed with rosemary and grilled. It's not often I get the chance to have something like that while my other half is chowing down on a greasy burger and thick milkshake, so I ordered the seabass (£9) and really enjoyed it. I had it with sweet potato wedges (£3) which were so good I wondered why I don't see them on menus more often, and indeed why I don't make them at home. The milkshakes and in particular the alcoholic milkshakes look to die for, and I love the fact that Filtered London Water appears on the menu, free of course, with the message "Sorry we don't believe in selling mineral water as it puts a huge demand on our planet". Great tasting food, with both dirty burger and healthy options, and a social conscience to boot - what's not to like? 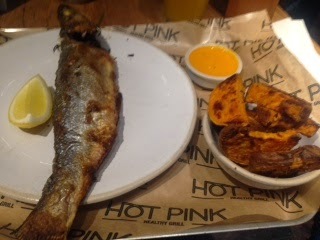 This is a great little restaurant that I'd definitely use again if I was going to the theatre or shopping in Wimbledon.